Keith Olbermann is not a name to overlook in the world of news, sports, and political commentary. The writer and commentator has worked with several sports media outlets where he has shown great skill and stood out among his counterparts. He worked with CNN as a sports correspondent in the 80s and now works for ESPN. He also worked with Current TV network from 2011 to 2012 as a chief news officer and as a host. Olbermann’s career has been filled with stories of rises, falls, controversies and growth too. It will be quite interesting to find out more about the sports personality. He was born on January 27, 1959, in New York to his parents; Marie Katherine, his mother and Theodore Olbermann, his father. He grew up alongside his younger sister with his parents in Hastings-on-Hudson in Westchester. Keith who was an ardent lover of baseball began writing about baseball card collecting at a young age. He attended Hackley School in Tarrytown. While at the school, he started his broadcasting career by working as a play-by-play announcer for WHTR. Keith graduated from the school in 1975 and proceeded to Cornell University. At Cornel he was the sports director for WVBR a commercial radio station in Ithaca. After graduating with a BS in communication he kicked off his professional career at UPI and the RKO Radio Network. Olberman later joined CNN in 1981. He covered a lot of sports events including the 1980 Winter Olympics. He worked at WCVB-TV as a sports anchor for a short while and then moved to Los Angeles to work at KTLA and KCBS. Keith bagged 11 Golden Mike Awards for his work in LA and was also named best sportscaster by Associated Press in California. He started working at ESPN’s SportsCenter in 1992 and left the position in 1997. Before this time he also worked at ESPN2 for a year. After a remarkable experience at Sportscenter, Olbermann co-authored a book with Dan Patrick whom he worked with at the program. The book titled ‘The Big Show’ detailed their experiences while at Sportscenter. He landed himself a two weeks suspension in 1997 for making an unauthorized appearance in Comedy Central’s The Daily Show. This caused a rift between the sports broadcaster and ESPN which led to his exit from the organization. He Hosted The Big Show with Keith Olbermann which aired on MSNBC. The talented commentator joined Fox Sports Net in 1999 and anchored their weekday sports news show, National Sports Rep. He worked as a CNN Correspondent on News Night from 2001 through 2003. Afterward, he created and hosted his own show Countdown with Keith Olbermann which debuted on MSNBC in March 2003. He had his contract for the show extended to four years in February 2007 and in 2008 it was reported that Keith signed a four-year contract extension with MSNBC. However, in 2011, MSNBC terminated its contract with Olberman. This was after the long rivalry between Olbermann and political talk show host Bill O’Reilly which stemmed from the former’s incessant coverage of a sexual harassment suit filed against the latter. Olberman presents commentaries on ESPN’s SportsCenter in recent times. As a sport and political commentator, Keith Olbermann has garnered quite a lot in the course of his dynamic career. He sits on a net worth estimated at $35 million which he has his very many media stints to thank for. The media personality earned as high as $2 million as salary during his time with MSNBC. See Also: Donna Brazile Bio, Husband, Net Worth, Why Was She Fired From CNN? This must have been part of his contract with the company which was extended to four years at the rate of $30 million in 2008. Apart from MSBNC, he earns a great deal from his shows which have pulled momentum over the years. Personal Life – Is He Married and Who is the Wife? 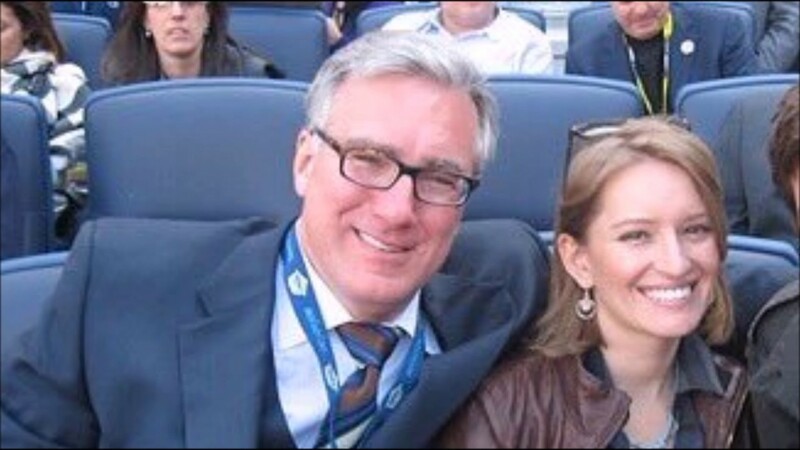 It may be his line of business or other factors we do not know about but Olbermann is not married to anyone. Nevertheless, the sports commentator sure has his own love stories. Keith used to be in a relationship with journalist Katy Tur. Tur anchors at The Weather Channel’s Vortex2 team. The two started dating in 2006 when Olberman was with MSNBC. However, in 2009 they went their separate ways. Tur had received bashings subsequently for allegedly sleeping with Keith to get herself a position at MSNBC. Olbermann was also involved with American basketball player, Rebecca Lob, TV personality, Laura Ingraham and others.